Aaron Peers of Jacksonville, Florida made margaritas in his backyard on Memorial Day weekend. That’s not a newsworthy event until you hear about what happened two days later. Peel woke to find his hands covered in painful blisters, a severe case of “margarita dermatitis” caused when the lime juice on his hands reacted to the sun. 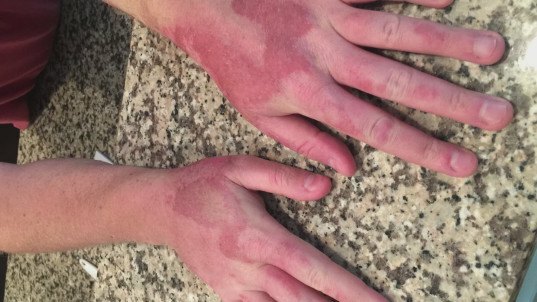 Technically known as “phytophotodermatitis,” the condition leaves second-degree burns, including extreme blistering and redness, on any area of the skin where the lime juice had been. So, here’s how it happened: Peers and his bride-to-be Alyse Golden were hanging out in the backyard, and Peers juiced some limes for fresh margaritas. Lime juice got on his hands, his wrists, and perhaps a little bit dribbled down his forearm as well. Maybe he toweled it off, or maybe he didn’t. You’re about to have a margarita, so a little juice on your hands in the least of your worries, right? That’s true… until the citric acid in the lime juice reacts with UV rays to leave painful second-degree burns all over your hands. Although you and I may have never heard of this type of “lime disease,” medical professionals are well-versed. Even the FDA warns against sun exposure after applying a variety of acids to the skin, including alpha-hydroxy acids (one of which is citric acid) and beta-hydroxy acids, which are common in anti-aging skincare products. Peers’ wounds have improved, but he won’t be back to normal for some time. The couple tied the knot on June 9, but they’ve been forced to postponed their Hawaiian honeymoon in order to keep Peers out of the sun until his burns have healed completely. And now, just for fun, let’s watch Chris Pratt sing “Margaritaville” with Jimmy Buffett at a “Jurassic World” after-party. 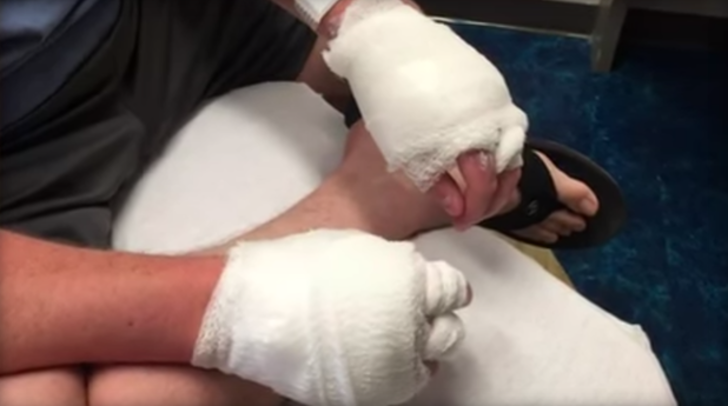 Man gets second degree burns from lime juice.